Born in Innsbruck, Austria, Ettore Sottsass grew up in Milan, where his father was an architect. In 1939 he graduated from Politecnico di Torino in Turin with a degree in architecture, and soon after served in the Italian military spending much of the Second World War in a concentration camp in Yugoslavia. After returning from the war, Sottsass set up his own architectural and industrial design studio in Milan in 1947, one of a new group of Italian designers dedicated to postwar reconstruction, which included the likes of Gio Ponti and Carlo Mollino. 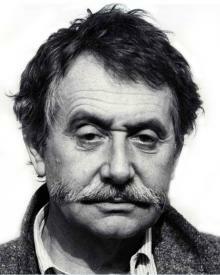 Interested in south Asia, Sottsass traveled to India only to return to Italy a very sick man. Luckily, he had been befriended by Adriano Olivetti, son of Camillo Olivetti, and was given a blank check to seek a cure in the United States. Rejuvenated in health and spirit, Sottsass returned to Milan where, despite his lack of technical knowledge, he began working as a consultant designing Olivetti's electronic equipment, typewriters and office furniture. Iconic pieces include his redesign of the ELEA 9003, Olivetti's mainframe computer, which won him Italy’s highest design award in 1959, as well as the bright red Pop Art inspired Olivetti Valentine typewriter he designed with Perry King in 1969. In 1981, Sottsass and an international group of young architects and designers came together to form the Memphis Group. Memphis was launched with a collection of 40 pieces of furniture, ceramics, lighting, glass and textiles, which featured fluorescent colors, slick surfaces, intentionally lop-sided shapes and squiggly laminate patterns. The groups colorful, ironic pieces departed considerably from his earlier, more strictly modernist work, and that was hailed as one of the most characteristic examples of Post-modernism in design and the arts. As an industrial designer, Sottsass’s clients included Fiorucci, Esprit, the Italian furniture company Poltronova, Knoll International, and Alessi. As an architect, he designed the Mayer-Schwarz Gallery on Rodeo Drive in Beverly Hills, California, with its dramatic doorway made of irregular folds and jagged angles. In the mid 1990's he designed the sculpture garden and entry gates of the W. Keith and Janet Kellogg Gallery at the campus of Cal Poly Pomona.